Of course parents are often the most acute observers of emerging ‘digital’ practices in their families, as we’ve noted before on this blog. But parents also discover and embrace technology for themselves. 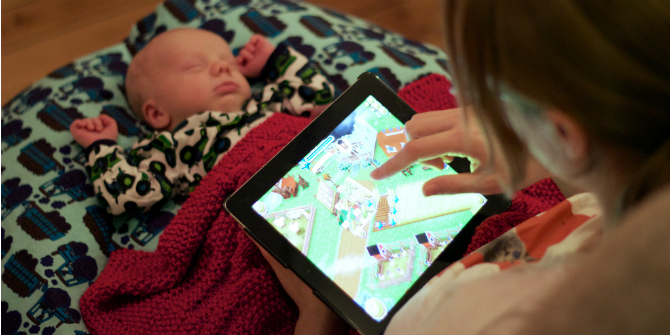 Judith Livingstone¹ recently had her first child and provides a humorous insight into her technological life, post-baby. After her maternity leave, she returned to her job as an associate at a London-based law firm, specialising in structured finance and regulated industry financing. Much gets written about the harm of living in a digital age can do, with plenty of articles claiming that too much time surfing the internet, playing with electronic gadgets and watching TV can give you square eyes, ADHD, autism or a predilection to violence. Much also gets written about the guilty use of smart monitors or the Apple watch. In this post, I want to address a different point: as a new parent, I am fairly sure that without the internet (and easy connection through my tablet and smartphone) I would have been lost when my daughter was born. Simply put, the internet is really great when you become a parent. And so are tablets and smartphones. When I had my daughter, I went very quickly from being a very active, intensely social person to spending all my time sitting on the sofa with a creature whose only interest in me was as a food source. It was a huge shock to me, and I think I would very likely have succumbed to depression had I not had my beloved iPad to keep me company. While I did antenatal classes and joined the NCT, it did not produce the bunch of lifelong friends the brochures promised. Instead, I turned to Facebook, where a lot of friends I knew through conventional methods were wonderful. Existing parents offered advice and virtual gin, not-yet (or ever) parents sent funny pictures of cats at all hours of the day and night, and a few friendships I had lost touch with in the real world were rekindled around play dates. When it came time to hire a nanny, I posted a request for help on Facebook, and a former colleague provided a three-page memo of advice. Where did we find the nanny? Gumtree. Before the baby even arrived I was grateful to be having this baby in the digital age. The books I read about pregnancy went discreetly onto my Kindle so neither my colleagues nor fellow commuters needed to know before I was ready to buy the badge and announce my pregnancy. My Kindle was also indispensable in the months of intense breast feeding, since you don’t have your hands free to turn the pages of a book! We keep family updated using technology, too, with photos posted straight to Instagram (the baby has her own account) – the baby’s grandfather bought a tablet especially to follow the Instagram feed. Once a week, he drives his tablet to the baby’s 90-year old great-grandmother in rural Yorkshire, because technology will only get you so far with Yorkshire farmers. The baby, of course, needs constant entertaining, and I was not prepared for how demanding this would be. Fortunately, the digital age came to my rescue again. YouTube produced baby-friendly abstract images. Spotify provided streamed tunes for us to dance to. The Baby Connect app suggested weekly games to play to help her development. And, of course, we did a lot of singing and baby yoga classes, found on the internet through sites like the brilliant, but sadly localised, OllyOlly. And the baby–technology interface cuts both ways. Before I had my daughter I was a competent but uninspired user of technology. Proficient in Word, Internet Explorer and Facebook, but not interested in exploring the opportunities that smartphones and tablets had created. That has changed. I now put filters on my photos, upload videos to my social media accounts, provide information to my daughter’s carers through a blog and arrange play dates and coffee/pub meetings through WhatsApp. Had I not had my daughter I would not have discovered all these new-fangled toys and my world would have been narrower, although my phone bill would undoubtedly be smaller. If we had had this baby 10 years ago, I would have had to rely on phone calls to keep me in touch with friends and family (so I would have lost touch), notices pinned up in local cafes to tell me about baby classes (so I would not have known about many of them), and I would have spent a lot of time at the chemist developing film (so there would be many fewer photos). I sincerely believe that the ease of access to information, entertainment and virtual friends enabled by having a tablet and a smartphone made the difference between becoming depressed when my daughter arrived and having an amazing maternity leave. And, of course, in extremis, the tablet and phone make amazing toys for the baby to bash and chew. ¹ Judith is the sister of Sonia Livingstone, the principal investigator of the Parenting for a Digital Future research project. Thanks Judith, this blog really made me smile. With just a few changes to names and geography, this would be an exact description of my own experience.